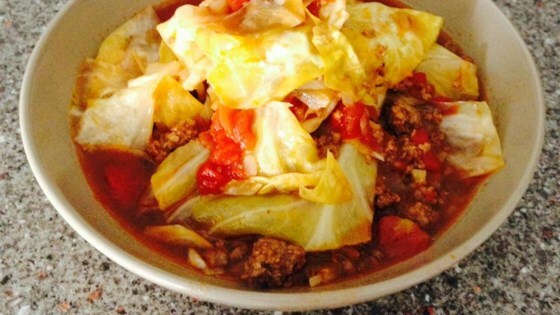 "This is a simple recipe for a wonderful rich cabbage soup." Crumble the ground beef into a large pot. Add the diced tomatoes, tomato sauce, beef bouillon cubes, carrots, onion, vinegar, sugar, salt and pepper. Pour in 1 quart of water, and bring to a boil. Stir to break up the beef while heating. Once the soup comes to a boil, cover and simmer for 30 minutes over low heat. Pour in another quart of water, and return to a slow boil. Add garlic and cabbage. Simmer for 25 minutes, until cabbage is tender. Ladle into soup bowls to serve. This is pretty good stuff! Make sure you have big pot or make the serving sizes smaller. Our largest pot didn't quite cut it. It was overflowing by the end. Absolutely wonderful! Nobody could get enough of it. I used Splenda instead of sugar but don't make any other changes. It is great as it is.